Hormonal therapy offers a potentially powerful approach to the treatment of sexual disorders in men. However the interplay of different hormones within different bodily systems is carefully balanced; judicious judgement is required in the therapeutic use of hormones to minimize unwelcome side effects. A better understanding of how hormones work will help the physician to better tailor therapies for improved sexual responses in men. Hormonal Therapy for Male Sexual Dysfunction will provide the rationale for hormonal therapy in male sexual disorders, explaining the language of sexual endocrinology and its application in clinical practice. It will not be heavily referenced, in line with a more practical approach. This allows for smoother reading (and also relieves the burden of comprehensive citing from authors). Key evidence (clinical trials, Cochrane or other meta analyses) should be summarized in ‘Evidence at a Glance’ boxes and key references such as reviews, major papers can be provided in the ‘selected bibliography’ at the end of each chapter. 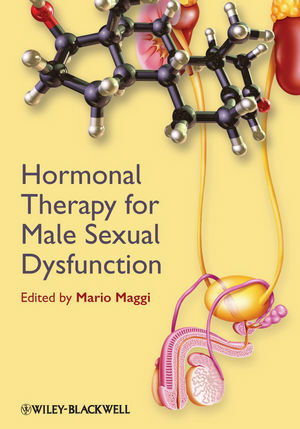 Professor Mario Maggi, MD is Chief of the Sexual Medicine & Andrology Unit in the Department of Clinical Physiopathology at the University of Florence, Italy. He obtained his MD at the University of Florence and has been Full Professor of Endocrinology at the same University since September 2000. Professor Maggi is Associate Editor for several international journals, and also serves as an academic reviewer for many other journals. He is the Author of more than 220 peer-reviewed manuscripts, and has written several book chapters and invited reviews in the fields of human reproduction and sexual medicine. For his work in these fields he has received numerous research grants and presented at both national and international meetings. Professor Maggi is currently Chief of the Didactic Committee of the Italian Society for Endocrinology. In addition, he is a member of the Scientific Committee of the European Society for Sexual Medicine and coordinates the regional activity of the Italian Society of Andrology and Sexual Medicine. He chaired, together with Jacques Buvat, The Committee for Endocrine Aspects of Male Sexual Dysfunction of the 3rd International Consultation on Sexual Medicine of?ISSM.